Anyone that has previously held Ministerial Status under Creativity’s founder, Ben Klassen, or other Church leaders, may retain their title. After a mandatory six months as a Prospective Church Member and proof that you are able to adequately fill the position of Minister of Creativity, you will be issued with a new Ministerial Certificate. MATTHEW HALE FANBOYS, DON’T WASTE OUR TIME OR YOUR OWN. WE DO NOT WANT YOU. WE DO NOT SUPPORT HALE OR HIS CHOSEN PEOPLE. IF YOU DO NOT KNOW WHO MATTHEW HALE IS, ALL THE BETTER FOR YOU. FOR MORE INFORMATION, SEE THE NOTICES ELSEWHERE ON THIS PAGE. In brief, a member of the religion of Creativity: believes in its mission, accepts instructions issued by his or her superiors, and fights for its aims. Further, membership is only invited to those of idealistic purpose. 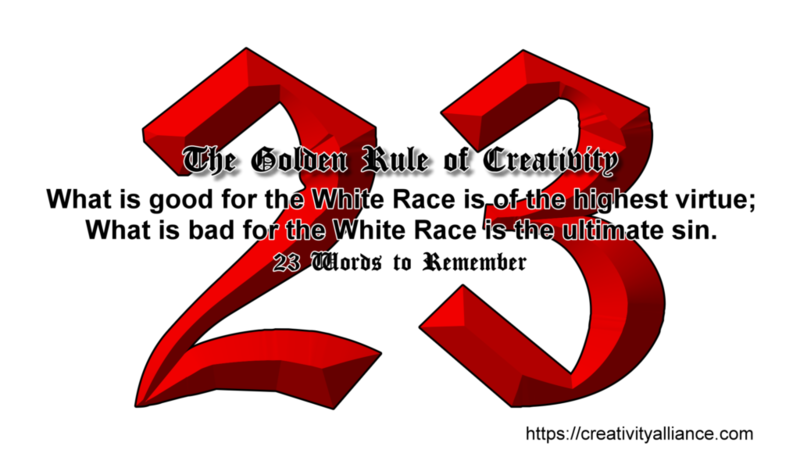 While the Church of Creativity wants all to support its aims and to believe in the religion of Creativity with a whole heart, it recognizes that not all White Racial Comrades are ready for the duties and self-sacrifice and self-discipline necessary to be an actual member of the Church. Those White Racial Comrades should instead become Official Supporters of the Creativity Alliance and assist the Holy Cause in whatever capacity they are able in that context. Becoming an activist for the Church of Creativity is often a lonely thankless task. You may have to work alone for long periods, or you may have to assume responsibility and form your own Church Primary Group. You also may have to accept directions from more experienced Creators. Whatever your situation, remember that the Church of Creativity does not carry passengers. Anyone that does not pull their weight will be dismissed from the Church. Henceforth, the Cost of Membership is for the time being $35 (usually $50) per annum. With payment of your Membership Fee, you will receive a Membership Package, which consists of the Little White Book and the Creativity Alliance Handbook. After you have successfully completed your mandatory Prospective Period (see below), you will also receive a Membership Certificate style receipt, and a cloth CA patch. Church Supporters receive the same package but without the mandatory waiting period. The Church Supporter patch will be issued subject to availability. In the future, fees will be set at an initial $50 to join the Church, with $35 per annum as ongoing membership fees. Official Supporter fees will remain at $35. New Church Members are required to fill in the application and fulfil a mandatory minimum of six months as Prospective Church Members prior to being granted full Church Membership. Prospects are allowed to turn down Church Membership at any time up until they have been accepted as full Church Members. All Prospective Church Members are expected to distribute a minimum of 600 Church flyers of their choice (that is 100 flyers per month as selected from our range of flyers), or perform other duties equal in priority to flyering. For each month your Prospective Status is extended, we expect another 100 flyers distributed. Flyers can be self-printed or ordered from the Pontifex Maximus or the P.M.’s Liaison at the World Center of the Creators in Texas. All prisoners are required to fulfil a mandatory minimum of six months as Prospective Church Members upon exiting prison. All Skinheads are required to fulfil a mandatory twelve months as Prospective Church Members. 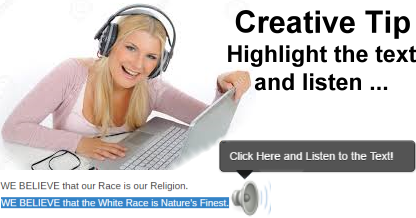 EXCERPT FROM RACIAL LOYALTY FORUM (2011): CREATIVITY IS NOT A SKINHEAD HOLLYWOOD NAZI RELIGION. CREATIVITY WAS NOT CREATED BY SKINHEADS OR FOR PEOPLE OF ANY ONE PARTICULAR FAD, CLASS OR NATION – CREATIVITY IS FOR ALL WHITE PEOPLE, NO MATTER WHERE THEY HAPPEN TO BE, THEIR CHOICE OF HAIR OR CLOTHING. IF YOU’RE A SKINHEAD UNDER THE IMPRESSION THAT CREATIVITY BENDS TO THE WILL OF YOUR SKINHEAD FAD, THEN TAKE THE HINT AND GTFO. CREATIVITY BENDS TO NOBODY AND NO FAD. Any Prospective Church Member with origins in groups opposed to Creativity are also required to fulfil twelve months as mandatory Prospective Church Members. Former Church Members expelled from the Creativity Alliance or the Premier Church of the Creator under Ben Klassen will not be accepted. Those expelled from the World Church of the Creator under Matthew Hale will be judged on their own merits. YourName@creativityalliance.com is also still available to those who choose to pay for the complete Church Membership Kit. Those who are issued a Church email address are expected to act as a Contact Point for the Church. Not responding to emails will result in your email address being withdrawn and a warning of dismissal from the Church will be issued. The Church of Creativity is not a Facebook club. We expect you to contribute to the greater Creator Community and get active on the street. If the entire extent of your “activism” consists of posting on Facebook and Twitter, and you do not post on Racial Loyalty News (formerly Creator Forum) or contribute to Racial Loyalty Newsletter, you will be dismissed from the Church and relegated to the position of Official Church Supporter. Failure to remain in contact with the Church body for longer than three months – without prior arrangement – will also lead to dismissal from the Church. Similarly, those who quit the Church – whether on good terms or otherwise – forfeit all titles and rights as a Creator. Those who quit on good terms may consider themselves to be Church Supporters and are permitted to continue to refer to themselves as Creators. Ministers of the Church who quit will be considered to be in breach of their sworn Ministerial Oath. Nevertheless, anyone that quits the Church should not expect to maintain the respect of those who remain dedicated to our Holy Creed and Cause. Anything and everything bearing a name, title or image representing our Church remains Church property. Church Members leaving in good standing can request special permission to retain Church property – which we are likely to grant considering we are a religious group and we want our people to go out and spread the good word of the militant White Man’s Religion of Creativity. Church Members leaving in bad standing must surrender all Church property to their nearest Church Member. Tattoos must be covered, or removed. We do have many people that remain offline and refuse to contribute to the greater Creator Community. Some do so through no fault of their own, and others do so either because of a racial lethargy or sheer cowardice. Such members will each be considered on their own merits, but the expectation is that they will be dismissed from the Church and relegated to Official Supporter status. If you are unable to contribute your efforts to the Church of Creativity in any way at all, then we do not want you. Our Church needs genuine, dedicated White Racial Loyalists who are ready to be active NOW and do whatever it takes to win this Racial Holy War. Do you have what it takes? What are you waiting for?